This new catalytic diffuser oozes delicate style and femininity. Lamp in frosted glass with a very delicate floral decoration with a sheer effect. The lamp is topped with a very pretty sphere mounting in shiny silver. Product benefit: Presented in a pretty decorated boxed set and accompanied with the Délicat Osmanthus Home Fragrance, this fragrance diffuser is an ideal and original gift, available as a limited edition! 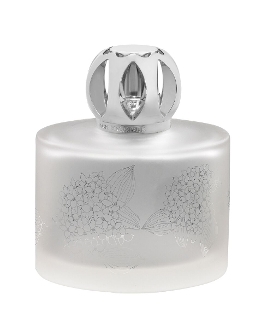 Expert tip: Take care of your home by using your Lampe Berger every day for purified and fragrant air. Lamp sold in a boxed set with accessories: wick-burner, round mounting, snuffer and funnel and 180 ml Délicat Osmanthus home fragrance.